Discussion in 'Patriots Draft Talk' started by mayoclinic, Jan 2, 2015. I was going to post this under Grid's new backdraft thread, but it's long enough to warrant being kept separate. I'll link to it from that thread. This is an absurdly early exercise and will likely be mostly wrong (probably on several fronts), but with that caveat, here's an early "master plan" for 2015 that I'm using as a working template. BWAHAHA! - I'm using Miguel's January 1 numbers for the Pats showing $144.7M currently devoted to signed players plus $4.6M in dead space, for $149.3M currently committed to the 2015 cap. - Therefore I'm assuming roughly a zero sum game. - I understand that the Pats will need around $6M in reserve for rookie and UDFA signings and for reserve operating funds. I haven't quite sorted that out yet. This is a work in progress, and a 1st pass attempt. 1. Convert $6M of QB Tom Brady's base salary to signing bonus. According to Miguel, with will free up about $4M in 2015 cap space. 2. Restructure LB Jerod Mayo along the lines that Miguel has proposed, which will free up around $4M in 2015 cap space. 3. Cut WR Danny Amendola with a post-June 1 designation. Per Miguel, this frees up $4.2M in cap space. 4. Sign CB Darrelle Revis to a long term extension. Say 4 years/$60M with $45M guaranteed and a $20M signing bonus. Base salary + incentives of $6M, $9.5M, $9.5M and $15M (non-guaranteed). 2015 cap hit of $16M ($6M salary+incentives + $5M pro-rated signing bonus + $5M carryover from 2014). 2015 cap savings of $9M. 5. Sign OT Nate Solder to a long term extension. 2015 cap savings of roughly $2M. 6. Extend OT Sebastian Vollmer by one year (through 2017) for around $5M, freeing up around $1M in 2015 cap space. 7. Extend CB Brandon Browner by one year (through 2017) for around $4M, freeing up around $1M in 2015 cap space. 8. Extend CB Kyle Arrington by one year (through 2017) for around $4M, freeing up around $1M in 2015 cap space. Total 2015 cap space freed up about $26.2M. Other moves, such as cutting TE Michael Hoomanawanui ($1.2M cap savings) would free up additional space, but can be done later. Cutting DT Vince Wilfork frees up over $8M, but I think that should be a last resort. My guess is that the can squeeze a bit more, but I haven't worked it out. 1. Sign DB Devin McCourty to a 5 year/$40M extension with $16M guaranteed and a $10M signing bonus. Base salary+incentives of $2.5M, $5.5M, $6.5M, $6.5M and $9M. 2015 cap hit: $5M. 2. Sign DE/OLB Akeem Ayers to a 4 year/$16M extension with $7.5M guaranteed and a $6.5M signing bonus. Essentially the same deal that Kyle Arrington got in 2013. Base salaries+incentives of $1M, $2M, $3M and $3.5M. 2015 cap hit: $2.625M. 3. Sign Alan Branch to a 2 year/$3M contract with $1M guaranteed and a $1M signing bonus. Base salary+incentives of $1M in 2015 and 2016. 2015 cap hit: $1.5M. 4. Sign LB Jonathan Casillas to a 3 year/$4.5M contract with $2M guaranteed and a $1M signing bonus. Base salary+incentives of $1M, $1M and $1.5M. 2015 cap hit of $1.333M. 5. Sign K Stephen Gostkowski to a 4 year/$16M deal with $5M guaranteed a a $4M signing bonus. Base+incentives of $2M, $3M, $3M and $4M. 2015 cap hit: $3M. 6. Sign RB Shane Vereen to a 3 year/$8M extension with $3M guaranteed and a $1.5M signing bonus. Base salary+incentives of $2M, $2M and $2.5M. 2015 cap hit of $2.5M. 7. Re-sign ERFA DT Sealver Siliga - $660K per Miguel. 8. Re-sign RFA FB/H-Back James Develin. Say 3 years/$2.1M, $700K guaranteed, $300K signing bonus. 2015 cap hit of around $700K. I would offer the Pats early 4th round pick from TB to New Orleans for DB Kenny Vaccaro. Vaccaro has 2 years left on his rookie deal. He would be a perfect fit as a hybrid S/LB/slot CB for the Pats. He was benched twice this season, partly over mis-use as a classic SS. I don't know if he can be gotten, but I'd make a run at him. If it doesn't work out, then I'd re-sign Pat Chung for something around 3 years/$8M with $3M guaranteed and a 2015 cap hit of about $2.5M, similar to Vaccaro's 2015 hit. 1. Clint Boling, OL, Cincinnati / James Carpenter, OL, Seattle. Either would be able to plug in at LG right away. Boling is a terrific pulling guard, Carpenter is bigger and has versatility at multiple positions. Getting either may be a long shot, but I'd pursue it if at all possible. Say something like 4 years/$20M with $8M guaranteed and a $4M signing bonus. Base salary + incentives of $3M, $4M, $4M and $5M. 2015 cap hit: $4M. 2. Eddie Royal, WR, San Diego. Much more of a vertical threat than Danny Amendola, more similar to Emmanuel Sanders. Say 3 years/$12M with $4M guaranteed and a $3M signing bonus. Base salaries + incentives of $2.5M, $3M and $3.5M. 2015 cap hit: $3.5M. I would also like to find a way to cut Hooman and use his $1.2M cap savings to go after an upgrade. Lance Kendricks, Rob Housler and Charles Clay are all FAs. Right now I'm not sure how to squeeze that in so I'm leaving it out, but it's something to keep in mind. Total 2015 cap hit for internal and external signings: $27.4M. It's quite tight and might need a bit of tweaking, but I think it could be made to work. 20. DB Kenny Vaccaro/Pat Chung ($2.57M). Again, it would need a little tweaking, but it's not far off. The Pats could field a VERY good squad from that group, without having to fill holes in the draft. That team would retain all the key FAs and upgrade at the safety (Vaccaro), left guard (Boling/Carpenter) and #3 WR (Royal) positions, without an overall increase in 2015 cap hit. Key losses would include OL Dan Connolly (possible retirement) and RB Stevan Ridley. ***Trade: Pats trade 1st (32) and 3rd (96) round picks to move up to around 24-25 in the 1st round. 1st (24-25). Eddie Goldman, DT, Florida St. 6'4" 320#. A cross between Ndamukong Suh and Haloti Ngata. He'll be a stud anchoring the interior of the DL for a long time. ***Trade: Pats trade 2nd (64) and 4th round picks to move up to around #50in the 2nd round. 2nd (50'ish). Cam Erving, OL, Florida St. 6'4" 310#. If he doesn't last this long then someone like Ty Sambrailo or Ereck Flowers could be an option. 3rd (97 - comp). Noah Spence, DE/OLB, Ohio St. 6'3" 255#. 6th (from TB). DeAndre Smelter, WR, Georgia Tech. 6'3" 222#. Gets a red shirt year to recover from his ACL tear. 6th (comp). Josh Robinson, RB, Mississippi St. 5'9" 222#. "The human bowling ball." 7th (from Tenn). Tre McBride, WR, William & Mary. 6'1" 205#. Will compete with Tyms and Boyce for a roster spot. 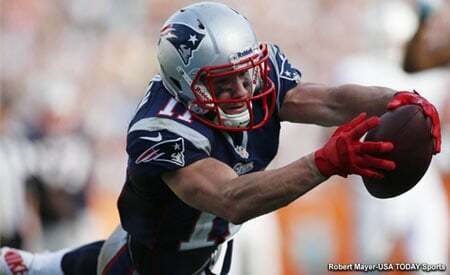 I'm hoping they can restructure Amendola. He's a good return guy and decent receiver to have (esp if JE is out) though he appears to have tiny hands. Maybe that's why he's always making catches with his chest. That seems like surprising big money for Akeem Ayers esp since he was recently on the scrap heap. Would he start if C Jones is healthy? 1. A starting guard. Clint Boling and James Carpenter are both young and solid starting level players who would solidify the interior OL. We have a lot of youth at the position, so adding a veteran might be attractive if affordable. We may not have the money and it may not be an option, but I at least wanted to float the idea. 2. The #3 WR. If either Amendola or Dobson had stepped up we would be fine, but we're a little thin. Eddie Royal is someone who I think is more like Emmanuel Sanders - a guy we tried to sign as an RFA 2 years ago even when we had already signed Amendola - or Antonio Brown in terms of his quick twitch ability to create separation and spread the field. 3. A TE upgrade from Hooman. Tim Wright can be used as either a move TE or a split end, giving some versatility. Rob Housler, Lance Kendricks and Charles Clay are all FAs. I doubt Clay will get out of Miami, but Housler and Kendricks haven't set the world on fire, and have some ability. Again, I'm not suggesting that these are priorities ahead of wrapping up our own guys. That goes first. But if I had a choice I'd rather get a solid starting guard then keep Ridley. Amendola has been very limited in our offense, and restructuring him doesn't save enough money for another WR, plus there becomes a logjam at the position. It's not a given that he moves on, but I thought I'd at least explore it. A 5 year/$40M deal is comparable to what Eric Weddle got, and more than Kam Chancellor, Antrel Rolle or TJ Ward got. It's not as much as Earl Thomas, but I personally don't think it should be. Miguel came up with an $8M/AAV deal, though his was structured a bit differently and had only a $4M 2015 cap hit. I don't think it's unreasonable. Obviously, I have no clue what the actual answer will be. Mayo, as you probably already know by now, I am mostly completely with you.. I'd take that offseason in a heartbeat. I wonder if there is anything that we could get for Dennard (Ravens ?). Given how this year went it seems unlikely that he will be with us after his rookie contract ends and if all our CBs return I don't really see a permanent position for him that offers a lot of play time. I doubt that he is worth a lot in terms of draft picks but maybe a trade for another player ? Ayers was a cast off from tenn. Why would he get such a huge contract? I like th he Boling signing. Wonder how much he'd get. I love it Mayo! Every year we seem to see things the same way, give or take a few situations. Vaccaro is going to be a really interesting situation. It looks like they are going to be bringing back Rob Ryan, which makes me think Vaccaro will be the one moved out to find a guy who better fits their scheme. Whether its us or another team, he could be in a situation like Barron and Tampa for sure. 2. I am not sure i forsee the team extending Browner or Arrington at this stage. Browner especially, since his athleticism doesnt have room to fall off, and he is on probably the most team friendly deal outside of Brady. He is very easy to cut, and his contract length might end up being perfect. Arrington and Browner are right in that sweet spot age wise as well, where athleticism and IQ match the most, without losing too much either way. That can change quickly and without much warning though. 3. The tackle situation is going to be something interesting as well. With Cannon already done, it gives the team a lot of options. I could see a situation where either Solder or Vollmer are let go, but I wouldnt expect either move. They are in an enviable position to have the ability to walk away from the negotiating table if prices get a little too high, or if they feel they can get enough production from Cannon. 4. I have a feeling Ayers is going to come back, but if he doesnt, I would bet the team would look at a guy like Jabaal Sheard, who fell in to a similar situation as Ayers did this year. He is still very young, but he has great size and there is the Lombardi connection as well. The offseason is always interesting around here, so I could see us being involved on every type of player. I could see Knighton, Carpenter, Fitzgerald. Heck, if they cant bring back Revis, they could move all that money over to a guy like Houston. Nothing is really out of the realm until we see who we bring back, which i hope is everyone. Because he's played like a solid rotational player capable of starting. Arrington got a similar deal, and he was a UDFA cast-off picked up as a STer. You earn your contract, and guys with Ayers' skill set are in demand. If the Pats can do it for cheaper I'm all for it. It's just a guess, but I think the high end for Boling would be a Zane Beadles kind of deal (5/$30M), which would probably price him out of our range. The next tier down would be within reason, IMO. A lot depends on the market, and there's always the chance that Cincy might lock him up before he can test it. One thing that I like about such a move is that it frees the Pats up to not have to look for an immediate rookie starter at LG - or for an immediate starting OL at all. They would have Solder- Boling (or James Carpenter) - Stork - Fleming/Wendell - Vollmer, plus Cannon, so they would have 7 very solid linemen in place. That would give them the option of adding a stud linemen like Fleming in the draft, or going after someone like Maxx Williams (just to take one example) and taking a lineman later on. That seems to generally be the way the Pats prefer to operate - to go into the draft without having to look to fill glaring holes. Ayers has only played a few games. Teams might consider him unproven still. You wouldn't want to bid against yourself. Branch would be more likely to get more than him imo. I strongly disagree. The market is much stronger for pass rushers. Ayers is younger, and he's played much more for us than Branch. I think he'll be in demand if he hits FA. Again, we'll find out soon enough, and if the Pats can sign him for less I'm all for it. Just look at the deal Mark Anderson got aftet 2011 season. Similiar situation. Ayers is a much better athlete. Lots of effort went into this clearly, thanks for your contributions. Agreed, especially as a pass rusher who sets a pretty damn good edge. Having watched him play it's amazing we got him for what we did. Mid-season at that! Curious about your thoughts on a player I have my mind on Mayo. What do you think of CJ Spiller? Even before he was injured he wasn't being used as much as the last couple of years. Does a chance to get out of Buffalo re-juvinate his career?? A la Marshawn Lynch. Not comparing the two players. Just their situations. If we're trading up for Erving to start at one guard. I'd be content to spend of the money you have ear-marked for Boling/Vereen on him. Would NO trade us Vaccaro for Dennard? One could argue Dennard has had a better career so far. Just been hampered by injuries in 2014. Saves us a draft pick. Anderson was much more of a one-trick pony than Ayers. Ayers is a perfect fit in the Pats defense because he can play both DE and LB (both MLB and OLB), drop into coverage, and is decent at setting the edge. He brings a different look to his game than Chandler Jones, and provides different challenges for opposing linemen and QBs. He provides quality depth at both DL and LB, and is capable of starting at both positions without a significant falloff. That has huge value, IMO. Asked about Ayers’ versatile skill set, the coach praised Ayers’ smarts, versatility and overall skill set, saying he’s got a lot of Ninkovich in his game. “He played outside linebacker in college and at Tennessee,” Belichick said of Ayers, who has three sacks, 13 tackles and 20 quarterback hurries (both good for fourth on the team) in six games. “He played defensive end in sub situations, which is pretty common for a lot of guys like him, like a Rob Ninkovich-type of guy. But until we actually had him, we didn’t know exactly how that would manifest itself. But he’s smart and he’s had a lot of experience playing on his feet and he’s had a lot of experience playing down. I used Kyle Arrington's contract as a model for what I think the Pats might offer Ayers, because I see them similarly: guys picked up off the scrap him who can do a lot of things, who aren't nominal "starters" but who play an important role in the defense, and who are capable of starting. His deal would be in the range of guys like Brandon LaFell and Arrington, and a bit less than that for guys like Ninkovich and Edelman who are more proven and clear starters. I also thought that it's enough money that it might keep Ayers from testing FA - $7.5M guaranteed and a $6.5M signing bonus us non-trivial. Ayers might get more money elsewhere, but he fits in well with the Pats, and it's a pretty solid offer IMO. Ayers is only 25, so he would still have time to earn another contract down the road. It's actually not that far off the Mark Anderson contract (similar signing bonus and guaranteed money, with a slightly lower AAV), though I didn't remember that one and didn't use it as a model. I was a big fan of Spiller in 2010, and was interested in him for the Pats. Never expected him to go #10 overall, which was a big reach. I think he would be a terrific weapon, but I'm not sure what his market value will be. I'd take him over Vereen, but I wouldn't break the bank, and I don't think BB is willing to spend on any RB. The guy who I'd actually like to make a run at if the RB market is soft is Ryan Mathews, a bigger back than Spiller and with terrific receiving and blocking skills. Like Spiller and Moreno, a high 1st round pick (taken 2 picks after Spiller in the 2010 draft), fairly young, and with a career marked by inconsistency and injuries. Still another former high draft pick who never lived up to it is Darren McFadden. I think any of these guys would be good paired with Blount and the others in a RBBC. I'd address other needs first, see what the market is like, and potentially snag one if the value is there and the money available, but I wouldn't make it a priority over a starting caliber guard. I'm guessing that with so many of these guys available that the market will be soft. I doubt we'll do all 4 of these, but in general I think the offense could use an infusion. Thank you kindly. It built on a lot of stuff I had already done, so it wasn't that bad, and it was a useful exercise to put it together and put thoughts down on paper. 1. The Pats don't have a ton of room, but they have some contracts that they can work with to create some space to re-sign people, and maybe even dip into FA once or twice at a mid-level range. They will have to be selective (I let Connolly and Ridley go, and possibly Chung depending on the Vaccaro trade scenario) and spend carefully, but I'm confident they can manage things. 2. With the re-signings the Pats have 68 players under contract, 74 after my draft, which included only 6 picks because the roster was already so well stocked and so competitive. Add some UDFAs and a few veteran cast-offs and you have a 90 man roster for TC. 3. I'm not a capologist, but with the rule of 51 the Pats are under the cap by a decent amount. Most of the players further down on the list will likely be cut and don't have guaranteed deals, and the cuts will likely free up $3-4M in cap space for use as contingency funds during the year. So I think that the Pats can play things fairly close to the cap for now, wit the expectation that money will free up down the road. OL: Boling/Carpenter plus a 2nd round rookie like Erving/Flowers/Sambrailo would greatly solidify the interior line, and give the Pats 8 really good linemen. Probably the strongest OL in the BB era. WR: Exchanging Amendola for Eddie Royal would add speed and the ability to stretch the field. Dobson will hopefully be healthy, but Tyms/Boyce/McBride gives some competition for the #4-5 roster spots. The Pats only ran 3 WR sets around 30% of the time this year according to Reiss, vs. 55% in 2013. I also like the idea of DeAndre Smelter with a redshirt year, to give Dobson another year to prove himself. S: Re-signing McCourty is key. Duran Harmon has been decent as a backup, and Logan Ryan also has deep S capability. At the other spot, Pat Chung has been solid, but I think Kenny Vaccaro would be a big upgrade and would give the Pats a top young safety tandem to go with their top CB group. Tavon Wilson has come on strong and has a similar raw skill set to Vaccaro, so that would be a really strong pair at the S/LB/slot CB hybrid position (which Nate Ebner can also play to some extent). DT: A long term successor to Vince Wilfork is probably my top priority for 2016. There are some good ones likely to be in this draft, so if the value is there, I'd consider it well worth it, along with an OL and a rotational DE. I would be happy to toss Dennard in along with a 4th in for Vaccaro, if we have to sweeten the pot. I also like the idea that Manx has floated of signing former CFL player Delvin Breaux, who has some upside as a bigger outside CB. Not sure that we can land Breaux, though. I think Miguel possibly has an error or his site, as he lists Dennard with a 2015 cap hit of $1.517M, which seems very high for a 7th round pick in the 4th year of his contract. Spotrac and overthecap.com both have Dennard's 2015 cap hit around $675K, for an $840K+ savings. I've PM'd Miguel for clarification. I think Miguel has an error or his site, as he lists Dennard with a 2015 cap hit of $1.517M, which seems very high for a 7th round pick in the 4th year of his contract. Spotrac and overthecap.com both have Dennard's 2015 cap hit around $675K, for an $840K+ savings. I've PM'd Miguel for clarification. Given how little Dennard played in 2014, that's a lot to pay for a #5-6 CB. That might be another reason to trade him to a team where he'd be more likely to get playing time. Per Miguel's site, the Pats take on only a minimal amount of dead money for cutting or trading Dennard (around $15K), and save almost $1M in cap space.